For people with the name, see Boza (name). Boza, also bosa (from Turkish: boza ), is a popular fermented beverage in Kazakhstan, Turkey, Kyrgyzstan, Albania, Bulgaria, Macedonia, Montenegro, Kosovo, Bosnia and Herzegovina, parts of Romania, Serbia. It is a malt drink made from maize (corn) and wheat in Albania and Kosovo, fermented wheat in Turkey, and wheat or millet in Bulgaria and Romania. In Egypt where it is known as "būẓa" (بوظة) it is usually made from barley. It has a thick consistency, a low alcohol content (around 1%), and a slightly acidic sweet flavor. 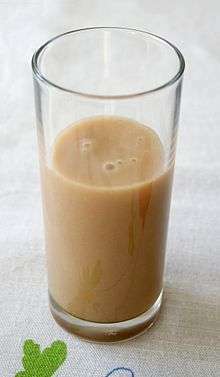 The etymon boza is also known from the Bulgarian drink buzá ‘a grey kvass-like drink’, borrowed by Turkish and perhaps the source of English booze ‘an alcoholic beverage’ via Romani (cf. also Chagatai, Ottoman Turkic etc. boza ‘drink made of camel’s milk’ and Chuvash pora, its r-Turkic counterpart, which may ultimately the source of the Germanic beer-word). Quite remarkably, modern Greek μπούζα (boúza), obviously a late loan, means ‘water elder’ – either it is a South Slavic loan although South Slavic forms seem to reflect only *bьзь (*b’z’) – or it is directly from Turkish with a meaning not attested there, having replaced the name for the same plant as in Slavic earlier in history. Fermented cereal flour (generally millet) drinks have been produced by native Anatolians and Mesopotamians since the 9th or 8th millennia BC, and Xenophon mentioned in the 4th century BC how the locals preserved and cooled the preparations in earthen pots that were buried. There are references mentioning boza-like "fermented (ground) millet drink" in Akkadian and Sumerian texts; the beverage is said to be respectively arsikku and ar-zig. In the 10th century that the drink was called Boza and became common amongst Central Asian Turkic peoples. Later it spread to the Caucasus and the Balkans. It enjoyed its golden age under the Ottomans, and boza making became one of the principal trades in towns and cities. Until the 16th century, boza was drunk freely everywhere, but the custom of making the so-called Tartar boza laced with opium brought the wrath of the authorities down on the drink, and it was prohibited by sultan Selim II (1566–1574). He describes a type of non-alcoholic sweet boza of a milk white color usually made by Albanians. In the 17th century, Sultan Mehmed IV (1648–1687) prohibited alcoholic drinks including boza, and closed down all the boza shops. This prohibition would be reinforced and then loosened several times in the history of the empire. The 17th century Turkish traveler Evliya Çelebi reports that boza was widely drunk at this time, and that there were 300 boza shops employing over a thousand people in Istanbul alone. At this period boza was widely drunk by the Janissaries in the army. It contained only a low level of alcohol, so as long as it was not consumed in sufficient quantities to cause drunkenness, it was tolerated as a warming and strengthening beverage for soldiers. As Evliya Çelebi explained in the first volume ("Istanbul") of his Seyahatname (Travelogues), "These boza makers are numerous in the army. 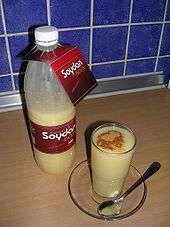 To drink sufficient boza to cause intoxication is sinful but, unlike wine, in small quantities it is not condemned." In the 19th century, the sweet and non-alcoholic boza preferred at the Ottoman palace became increasingly popular, while the sour and alcoholic type of boza went out of style. In 1876, brothers Haci Ibrahim and Haci Sadik established a boza shop in the Istanbul district of Vefa, close to the then center of entertainment, Direklerarası. This boza, with its thick consistency and tart flavor, became famous throughout the city, and is the only boza shop dating from that period still in business today. The firm is now run by Haci Sadik and Haci Ibrahim's great-great-grandchildren. Boza is produced in the Balkans and most of the Turkic regions, but not always using millet. The flavour varies according to the cereal which is used. Measuring boza samples made from maize, wheat, and rice flours, researchers determined an average of 12.3% total sugar, 1.06% protein, and 0.07% fat. As boza spoils if not kept in a cool place, boza fermenters in Turkey (traditionally) don't sell boza in summer months and sell alternative beverages such as grape juice or lemonade. However, it is now available in summer time due to demand and availability of refrigeration. In Bulgaria, Albania and Macedonia, however, boza is produced as refreshing beverage year-round. Mevlut Karataş, the main character in Orhan Pamuk's 2014 novel A Strangeness in My Mind (Kafamda Bir Tuhaflık), is a boza vendor. ↑ "bosa." Webster's Third New International Dictionary, Unabridged. Merriam-Webster. 2002. ↑ "bosa." Oxford English Dictionary. 2nd edition. 1989. ↑ Goldschmidt, Arthur (1994) Historical dictionary of Egypt Metuchen, N.J. : Scarecrow Press. page 77. ISBN 9780810829497. ↑ Alpion, Gëzim I. (2011) Encounters With Civilizations: From Alexander the Great to Mother Teresa New Brunswick, N. J.:Transaction Publishers. page 46. ISBN 9781412818315. ↑ Hyllested, Adam. (2014). Word Exchange at the Gates of Europe: Five Millennia of Language Contact. Københavns Universitet, Det Humanistiske Fakultet. University of Copenhagen. pp.121. Archived April 2, 2015, at the Wayback Machine. ↑ LeBlanc, Jean Guy and Todorov, Svetoslav Dimitrov (2011) "Bacteriocin producing lactic acid bacteria isolated from Boza, a traditional fermented beverage from Balkan Peninsula – from isolation to application" in Méndez-Vilas, A. (Ed.) (2011). Science against microbial pathogens : communicating current research and technological advances. Badajoz : Formatex Research Center. pp. 1311-1320. ↑ Evliya Çelebi; Şinasi Tekin; Gönül Alpay-Tekin; Fahir İz (1989). Evliya Çelebi seyahatnamesi. Harvard Üniversitesi Basımevi. ↑ Garner, Dwight (October 20, 2015). "Review: Orhan Pamuk's 'A Strangeness in My Mind'". The New York Times. Retrieved July 4, 2016.